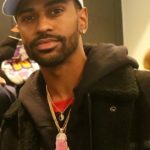 Sean Michael Leonard Anderson known professionally as Big Sean is an American rapper from Detroit, Michigan. Sean signed with Kanye West’s GOOD Music in 2007, Def Jam Recordings in 2008 and Roc Nation in 2014. After releasing a number of mix tapes, Sean released his debut studio album, Finally Famous, in 2011. He released his second studio album, Hall of Fame, in 2013. Sean’s third studio album, Dark Sky Paradise, was released in 2015 and earned him his first number one album in the US. In 2017, he released his fourth studio album, I Decided, which debuted at number one on the US Billboard 200 chart. "When I graduated from high school, the teacher said I was throwing my life away following music, and the same teacher invited me back to speak at the school. I don’t say that to brag, I just want to be an example."